Pine essential oil is obtained from the needles and cones of several species of coniferous trees belonging to the genus Pinus. This genus comprises of about 120 different species that are divided into 3 sub-genera based on cone, leaf and seed characteristics. 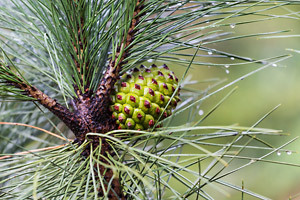 The pine oil normally used in aromatherapy is obtained from the needles of Pinus sylvestris, and over 140 varieties of this species have been described and catalogued in botanical references since records began. After reclassification, only 4 varieties of this species are currently acknowledged as being genetically distinct. There are several ‘pine’ oils derived from species other than P. sylvestris that are used in a broad range of industries, but many of these are not commonly available to aromatherapists since they are neither safe or appropriate for therapy. Also known as Scots pine, P. sylvestris is an attractive, tall coniferous evergreen tree with a straight, unbranched, cylindrical trunk that typically attains a height of 25 metres (81 ft) and even a lofty 40 metres (131 ft) when growing wild. It is a truly hardy species that can survive extremes of temperatures such as those of eastern Siberia which have been recorded as low as minus 83° F, as well as the high temperatures of the Mediterranean region. Its lifespan is normally 150 to 300 years, with the oldest recorded specimen in Sweden reaching 711 years! The bark of this fast growing tree is grey-brown coloured, deeply fissured and scaly on the lower trunk, turning to bright orange and flaky on the upper trunk and branches. Young trees have a pyramidal form, but as trees age their lower branches drop off leaving a distinctive long bare trunk with an irregular shaped, flat-topped or umbrella-like crown of leaves. The fragrant, stiff, needle-like leaves are 3-6 centimetres long, blue-green in colour and grow in twisted pairs. Seed-cones turn from green to brown as they mature, developing into a pointed ovoid shape 3-7 centimetres long. Pinus sylvestris is the only pine tree native to Britain and northern Europe and has the widest distribution of all pines, growing from Scotland almost to the Pacific ocean and from above the Arctic Circle in Scandinavia to the Mediterranean. The main producing regions of pine essential oil include Austria, Baltic States, France, Hungary, Siberia and Yugoslavia. Pine has a long history of use in folk medicine, and the entire tree yields a wealth of healing properties. The fragrant needles and twigs have been used for centuries throughout Europe and beyond to treat a wide range of respiratory, muscular and painful joint conditions. The needles and shoots were used by Native Americans to treat bronchial conditions, coughs, colds, fevers and rheumatic pain, and many tribes would burn parts of the tree along with juniper and cedar in their purifying rituals and to repel mosquito’s, lice and fleas. Pine essential oil derived from the needles and twigs has been used throughout Europe for fevers, arthritis, rheumatism, muscular pain and respiratory conditions. It is also incorporated in the fragrances of air-fresheners, disinfectants, detergents, soaps, bath toiletries and fougere fragrances. Needles and twigs are often collected all year round, except in countries where heavy snow causes problems with transportation. When severe weather does disrupt harvesting, stocks carried over from previous harvests are processed. Until the time of the First World War, pine needle oil was still produced abundantly in many small village distilleries throughout Russia. Prior to the distillation of pine oil, the needles and young twigs are chopped into small pieces in order to pack the still as tightly as possible. Steam distillation yields approximately 0.25% to 0.35% of colourless to pale yellow essential oil. The fragrance of pine needle essential oil is fresh, sweet-green, with fruity, resinous and balsamic overtones that are very reminiscent of the fresh needles. Pine needle essential oil has a wide range of uses, including a powerful antiseptic quality that can be put to great use during the cold and ‘flu season. Vaporising this oil can help to stop the spread of infection whilst also clearing a stuffy nose. Used in massage, its rubefacient and diuretic properties are invaluable for muscular aches and pains, arthritis, rheumatism, fluid retention and cellulite. Although not commonly documented, pine needle oil appears to have a mild analgesic action that really helps ease the pain of stiff joints and muscles. Pine oil acts as a tonic to the whole system making it good for convalescence as well as boosting the emotions, bringing upliftment and strength to negativity, sadness, nervous exhaustion and stress. It is a strengthening and grounding oil. Classed as a top note, pine needle essential oil adds a fresh, green note wherever it is used, and works especially well with cypress, cedar atlas and virginian, citronella, juniper berry, lavender, lemongrass, linaloe wood, marjoram sweet, peppermint, rosemary, sandalwood, spearmint and most citrus oils.